European frogbit (Hydrocharis morsus-ranae) is a recently documented invasive aquatic plant in the Upper Great Lake region. It can form dense floating mats that shade out submerged aquatic plants, affecting aquatic food webs. European frogbit (Hydrocharis morsus-ranae) is a recently arrived invasive wetland plant in the Upper Great Lakes region. It is a floating aquatic, with small leaves reminiscent of lily pads. It can form dense vegetative mats on the water’s surface, blocking out sunlight and preventing the growth of other aquatic species. While frogbit is still uncommon in Lakes Huron, Michigan, and Superior, we found it growing at Munuscong Bay in our study plots in 2011. We reported its presence to the Michigan Department of Natural Resources, and it has since been put on the state’s watch list as a priority species. 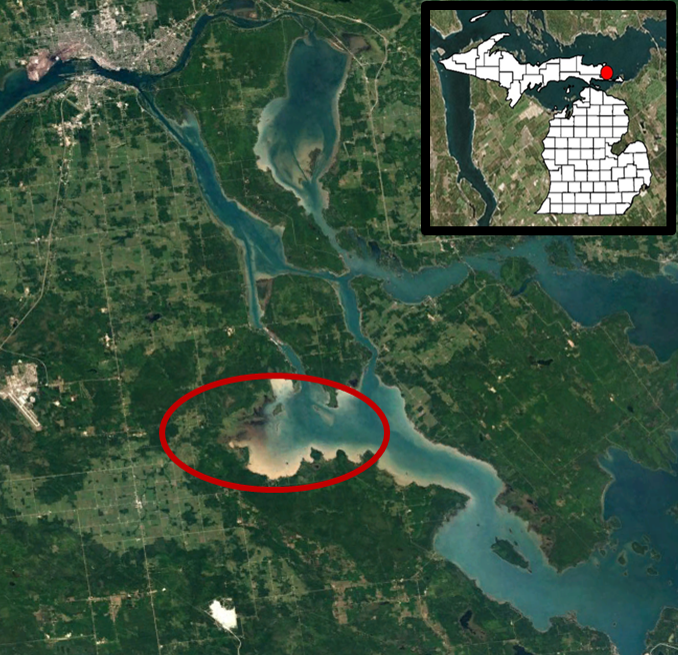 This map shows the location of Munuscong Bay in the St. Mary’s River in northeastern Michigan. Through qualitative observation and the analysis of a region-wide wetland plant dataset, we have concluded that frogbit invasion can be facilitated by the presence of invasive cattails. We suspect that the cattails, which are anchored in the sediment, buffer the floating frogbit from waves that would normally prevent it from establishing. Because frogbit is often found growing among cattails, it presents a significant challenge to invasive species managers. The current Best Management Practices (BMPs) for frogbit include herbicide treatment and physical removal. Both of these are hard to accomplish when the frogbit is in the midst of a dense cattail stand. European Frogbit growing among hybrid cattail (Typha × glauca). Preliminary analysis shows that the frogbit often associates with cattail, and it is likely that dense monocultures of cattail shelter the floating aquatic from wave energy, facilitating its growth. This association makes frogbit a difficult invasive to treat because it can be hard to find and remove among the cattails. In 2016 we began working on a Michigan DNR-funded project addressing frogbit management in cattail. We set up an experiment at Munuscong Bay that combines the treatments of above-water and below-water cattail harvesting, frogbit hand-removal, and herbicide treatment. We hypothesize that the treatments that had cattails removed prior to herbicide application will have a much stronger impact on frogbit. This experiment is also giving us an opportunity to test the effectiveness of herbiciding cattails compared to above-water and below-water harvesting, which we have done in mesocosms but not in a field trial. We used Arc GIS collector™ and rugged e-tablets to design and layout the MISG experimental plots in Munuscong marsh. The treatments included above water Typha harvest, below water harvest, herbicide combined with harvest, herbicide without harvest, and frogbit hand-removal. Because water-depths were higher than anticipated, we had to exclude harvesting treatments from two of the blocks. The southern-most block of plots on this map is one replicate of the 2016 GLRI-funded aquatic connectivity experiment. The deeper-than-expected water levels and sheer size of the site at Munuscong made the implementation of this project difficult, and we could not have set up the experiment without the help of staff from the Sault Tribe of Chippewa Indians and the Three Shores Cooperative Invasive Species Management Area. We are also collaborating with Dr. Jodi Brandt and Matt Unitis from Boise State University and Dr. Dennis Albert and Kate Wellons from Oregon State University to improve the remote sensing of frogbit and other wetland invasive species in the St. Mary’s River. Over the 2017 field season we will be collecting post-treatment experimental data from the Munuscong site, and we will continue to improve our remote sensing toolkit. The Softrak harvester working in the distance to clear one of the experimental plots. Drew, Gabby, and Corinn stand by a pile of hand-harvested frogbit. This picture shows one of the paired above/below water harvest treatment plots. The section on the left was cut at the sediment level using a sickle-bar mower attachment following above-water harvest with the Softrak. The open water patches created by below-water cutting should provide good habitat for waterfowl, but we also want to see how frogbit responds to the newly available opening. This image from the National Agricultural Imagery Program shows Munuscong Marsh shortly after our experimental treatments were implemented.